The Red Chair Blog: A Few Neat Ideas from a Client's Nursery...And the Giveaway Winner! A Few Neat Ideas from a Client's Nursery...And the Giveaway Winner! 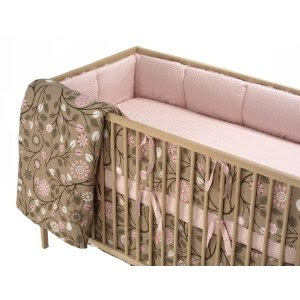 My client Dana contacted me to help with her daughter's nursery when she was pregnant. 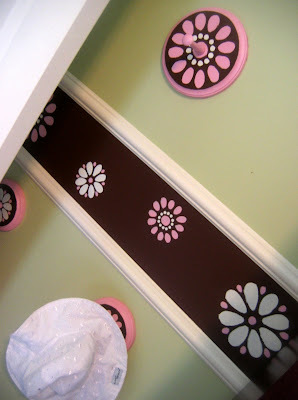 When we met, she had already selected her nursery furniture and her crib bedding, which was "Garden Blossom" by Dwell Studio: She wanted help selecting a wall paint color that would work with the bedding, and she also wanted some ideas for a paint treatment to add a little interest to the walls. 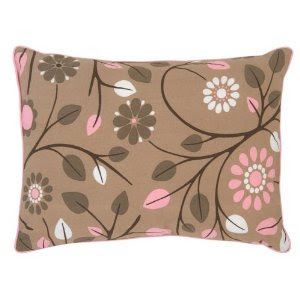 The bedding included shades of beige, chocolate, pink, and white: She wasn't wild about the idea of brown walls, and she knew that she didn't want pink walls, so we selected a warm-yet-neutral green for the walls--Valspar's "Martinique Dawn". And here's a close-up of the stencils. 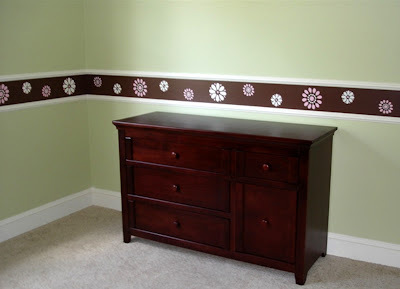 Dana shared that the stenciling was really time-consuming, but she also said that her daughter's love for the flowers has made it worth the time investment! Dwell Studio didn't offer a window treatment that coordinated with the crib bedding, so Dana made this pleated window valance from a crib bed skirt! 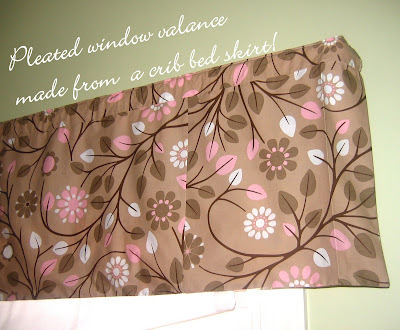 She reported that the valance was easy to make because the pleats were already built right in. What a great idea! 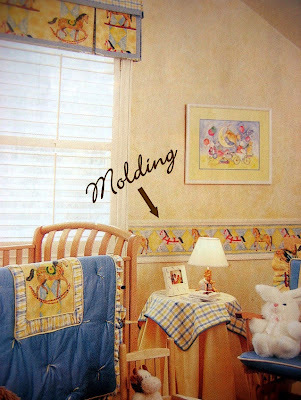 This would be a neat way to repurpose crib bedding when it's time to transform a nursery into a "big kid" room. Dana and Steve also made these unique wall hooks by combining wooden circles with pegs. 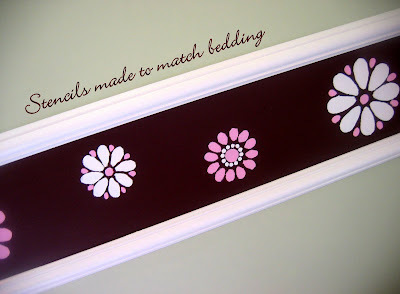 They were the perfect size for the stencils, and they're a great place to hang hats, sweaters, and those adorable hooded baby towels. Thanks, Dana and Steve, for letting me share these photos to inspire others! On another note, the winner of the CSN Stores giveaway is commenter #60, KottageKara of Kara's Kottage. Congratulations! Thanks to all who entered for your enthusiastic participation in this giveaway. I wish that I had a prize for everyone!